The new BSc in Politics and International Relations is designed for people who are passionate about politics, and who want to look in-depth behind the headlines to understand the forces shaping today's world. The degree will empower you to assess some of the most pressing challenges of our time, both domestically and globally. Our training will equip you with the tools through which to analyse data, conduct research, and write persuasively. No specific subjects. An essay based subject is preferred but not required. D3,D3,D3 in three Cambridge Pre_U Principal Subjects. Detailed course descriptions are available on the department website: Politics and International Relations BSc. Our goal is to produce graduates who can undertake independent research on complex questions, collecting and analysing data and other forms of evidence; who can express complicated ideas clearly and communicate them effectively in speech and writing; and who can construct and defend reasoned arguments about politics and public policy. 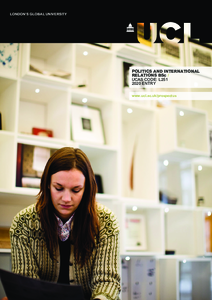 The BSc in Politics and International Relations will equip you with a range of skills. Your training in independent research, data analysis, writing, and logical reasoning -- alongside the breadth of knowledge you will acquire -- will be valued by employers across the public and private sectors. Alumni of the UCL Department of Political Science have gone on to careers working for the civil service, members of parliament, domestic and international NGOs, management consultancies and other private sector organisations, news organisations, and think-tanks, as well as undertaking postgraduate study. We are looking for applicants who have a passion for thinking critically about the world in which we live. We value applicants who express themselves clearly and without jargon, and who have a proven track record of academic success and engagement in their community.